Aim/Objective : To understand the importance of intensity of light in polymerizing light cured composites and its relation to color stability. Materials and Methods : Forty specimens of composite disc with 3mm diameter and 1.5 mm thick were divided into two groups of 20 samples each. Group1: Twenty samples were cured with a light curing unit of380mw/cm 2 . Group2: Twenty samples cured with a light curing unit of 680mw/cm 2 . These polymerized samples were immersed in methylene blue dye for 24hoursand later washed and immersed in absolute alcohol for 24 hours. The amount of color released into absolute alcohol was assessed by spectrophotometric and colorimetric analysis. Results : Results were analyzed for spectrophotometric and colorimetric values by using the Mann-Whitney test. The group cured with low intensity light stained more compared to the group cured with a normal intensity of light. Conclusions : Intensity of light plays a crucial role in staining of the polymerized light cured composite. The intensity of the curing unit has to be maintained in acceptable limits to achieve good clinical results. A lot of research has been undertaken on various light curing units and methods to cure the composite (light intensity, depth of cure, area of cure, irradiance of the light curing gun);however, the lack of maintenance of the light curing unit and constant measurement of the Logarithmic total exposure  can play a deleterious effect on the esthetic light cured restorations. The purpose of the study was to investigate the effect of intensity of the light curing unit and its relation to color stability of the polymerized composite material. Spectrophotometric and Calorimetric analysis were done to measure the dye absorption. Forty specimens of composite resin disc (Filtek Z250 IvoclarVivadent) with 3mm diameter and 1.5 mm thick were prepared by using spherical polyethylene moulds, and the samples were divided into two groups of 20 samples each. Two light curing units were taken from general dentists and their intensities were measured by using a radiometer. (IvoclarVivadent). The first group was cured with the light curing unit which had an intensity of 380mW/cm 2 and the second group was cured with the light curing unit with an intensity of 680mW/cm 2 . Mylar strips were used on the surfaces and polymerization was done according to manufacturer guidelines (20 samples for each group). After polymerization, the composite resin samples were removed from moulds, placed in an empty test tube and each specimen was placed in an incubator (37±2°C) for 24 hours. Later they were individually immersed in 1 ml of 2% methylene blue solution and placed at 37°C ± 2°C. After 24 hours, the specimens were rinsed under running distilled water for 1 minute and stored at 37°C ± 2°C at relative humidity for 24 hours. The specimens were immersed in new test tubes containing 1 ml of absolute alcohol for 24 hours. The solutions were filtered and centrifuged for 3 minutes at 4,000 revolutions per minute, and the supernatant was used to determine dye absorbance in a spectrophotometer and calorimeter at 590 nm. 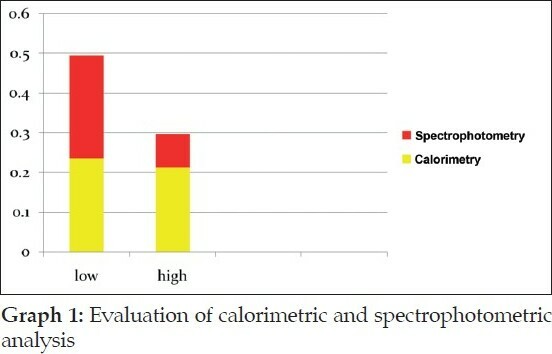 Results were analyzed statistically for spectrophotometer and calorimetric values by using the Mann-Whitney test (Graph 1). Spectrometric analysis showed that the composite cured with a low intensity light had higher dye absorption (P value 0.009); and, the results for calorimetric analysis were statistically insignificant (P value 0.171). Sensitivity of spectrophotometer is greater than colorimeter in detecting wavelength of colour. Hence, the results obtained with spectrophotometer are more reliable than the colorimeter. The irradiance of the light source, the exposure time and light transmission of composite are significant variables that affect the hardness or conversion profile. It is suggested that the depth of cure corresponds to the minimum amount of energy required to initiate polymerization. For a resin composite, the properties depend among other things, such as, the degree of conversion of the monomer. A high degree of conversion gives hardness and strength to the material,  as well as color stability  . Thus, a reduction in remaining double bonds to the lowest possible level is normally considered a desirable feature of a polymerization system. In the present study methylene blue was used, as it is the most commonly used dye for microleakage studies and the size of this dye is 120Ε or 1.2nm 2 which is less than that of bacteriae. This dye dissolves as monomer and dimer in aqueous environment. and is readily taken up by the composite discs by sorption phenomenon. Since instrument measurements eliminate the subjective interpretation of visual-color comparison, spectrophotometers and colorimeters  have been used to measure color changes in dental materials. The colorimeter and spectrophotometer works on the basis of Beer-Lambert's law, which states that the absorption of light transmitted through a medium is directly proportional to the concentration of the medium. Colorimeter is an instrument for psychophysical analysis, provides measurements that correlate with human eye-brain perception. It consists of sensor and simple data processor and has a set of illuminant and observer combination. It isolates the broad band of wavelengths using a tri stimulus absorption filter. Spectrophotometer is an instrument for physical analysis, and provides wavelength-by-wavelength spectral analysis of the reflecting and/ or transmitting properties of objects without interpretation by human. It consists of a sensor plus data processor or computer with software. It has many available illuminant/observer combinations. It isolates a narrow band of wavelengths using prism, grating or interference filter. Dye penetration method was used since the uncured resin matrix is more susceptible to dye absorption and also release of dye when placed in absolute alcohol. The degree of conversion of a given resin composite is influenced by the energy density. Insufficient energy density results in less than maximal conversion,  and the demonstrated differences in quantity of remaining double bonds are reflected in other polymerization characteristics. Energy density (J/cm 2 ) is equal to the product of light intensity and the irradiation time , . The peak wavelength among light curing units varies from about 450-490 nm, and the irradiance ranges from 400-800mW/cm΂. A 2mm thick resin composite restoration requires a radiant exposure of 8 J/cm 2 (400mW/cm 2 x20s=8000mWs/cm΂). In the present study keeping the time of exposure constant, it was observed that the energy density decreased for the samples cured with low intensity. Loupes et al., reported that longer curing time is required to generate sufficient energy density to cure 2mm increments of composite resins in lights with low output intensity. However,in another study  it was revealed that there is only a modest increase in the depth of cure (<25%), even upon doubling the exposure time. Decrease in line voltage of 6% shows a corresponding reduction in output of about 25%. A remarkable difference in intensity (40-50mW/cm΂) was also observed when sterilization sleeves or jackets were worn on the tip of the light curing unit. Vivek Hegde et al.,  reported that only 10% LED machines and 2% quartz-tungsten-halogen machines used by practitioners were in good condition. Most of the curing lights examined had low output intensity ranging from 200-400 mW/cm΂. Most of the curing unit tips had resin composite remnants on them.Barghi N reported 30% of curing units had power densities < 199mW/cm΂ and were considered inadequate for curing the composite resin. A few limitations exists in this study like the effect of saliva which was not taken into consideration, and also the effect of alcohol, which softens  and effect the surface integrity of composite resin while measuring the dye uptake was not considered.Before concluding, we would recommend further evaluation with a larger group of light curing units with low intensity. The role of different intensities of light on the color stability of the composite resins was determined. The specimens cured with low intensity light had a higher dye absorption, signifying the role of light intensity on the physical properties of composite resins like color stability. 1. Yazici AR, Celik C, Dayangac B, Ozgunaltay G. The effect of curing Units and staining solutions on the color stability of resin composites. Oper Dent 2007;32:616-22. 2. Hosoya Y. Five-year color changes of light-cured resin composites: Influence of light-curing times. Dent Mater 1999;15:268-74. 3. Kolbeck C, Rosentritt M, Reinhold L, Handel G. Discoloration of facing and restorative composites by UV irradiation and staining food. Dent Mater 2006;22:63-8. 4. Ferracane JL, Moser JB, Greener EH. Ultraviolet light-induced yellowing of dental restorative resins. J Prosthet Dent 1985;54:483-7. 5. Bagheri R, Burrow MF, Tyas M. Influence of food-simulating solutions and surface finish on susceptibility to staining of aesthetic restorative materials. J Dent 2005;33:389-98. 6. Calheiros FC, Sadek FT, Braga RR, Cardoso PE. Polymerization contraction stress of low-shrinkage composites and its correlation with micro leakage in class V restorations. J Dent 2004;32:407-12. 7. Park YA, Chae KH, Rawls HR. Development of a new photo initiation system for dental light-cured composite resins. Dent Mater 1995;15:120-7. 8. Peutzfeldt A, Assmussen E. The effect of post curing on quantity of remaining double bonds, mechanical properties and invitro wear of two resin composites. J Dent 2003;31:341-51. 9. Halvorson RH, Erickson RL, Davidson CL. An energy conversion relationship predictive of conversion profiles and depth of cure for resin based composites. Oper Dent 2003;28:307-14. 10. Ferracane JL. Correlation between hardness and degree of conversion during the setting reaction of unfilled dental restorative resins. Dent Mater 1985;1:11-4. 11. Asmussen E. Factors affecting the color stability of restorative resins. Acta Odontol Scand 1983;41:11-8. 12. Peutzfeldt A, Sahafi A, Asmussen E. Characterization of resin composites polymerized with plasma arc curing units. Dent Mater 1996;16:330-6. 13. Sarafianou A, Iosifidou S, Papadopoulos T, Eliades G. Color stability and degree of cure of Direct Composite restoratives after accelerated aging. Oper Dent 2007;32:406-11. 14. Yavuz, Aydin AH. New method for measurement of surface areas of microleakage at the primary teeth by biomolecule characteristics of methilene blue. Biotechnol. andBiotechnol. Eq. 19/2005/1. 15. Usemez A, Ozturk N, Ozturk B. Two year color changes of light cured composites: Influence of different light curing units. Oper Dent 2005;30:655-60. 16. Micali B, Basting RT. Effectiveness of composite resin polymerization using light-emitting diodes (LEDs) or halogen-based light-curing unit. Braz Oral Res 2004;18:266-70. 17. Abd El-Latif MM, El-Kady MF, Ibrahim AM, Ossman ME. Alginate/ Polyvinyl Alcohol - Kaolin composite for removal of methylene blue from aqueous solution in a batch stirred tank reactor. J Am Sci 2010;6:5. 19. Imazato S, Tarumi H, Kobayahi K, Hiaraguri H, Oda K, Tsuchitani Y. Relationship between the degree of conversion and internal discoloration of light activated composite. Dent Mater 1994;14:23-30. 20. Hegde V, Jadhav S, Aher GB. A clinical survey of the intensity of 200 light curing units in dental offices across Maharashtra. J Conserv Dent 2009;12:105-8. 21. Powers JM, Sakaguchi RL. Craig's restorative dental materials. 12 th ed. Maryland Heights, Missouri:Mosby,Inc2007, p. 205-7. 22. Lai YL, Lui HF, Lee SY. In vitro color stability, stain resistance, and water sorption of four removable gingival flange materials. J Prosthet Dent 2003;90:293-300. 23. Okte Z, Villalta P, Garcia-Godoy F, Garcia-Godoy F Jr, Murray P. Effect of curing time and light curing systems on the surface hardness of compomers. Oper Dent2005;30:540-5.